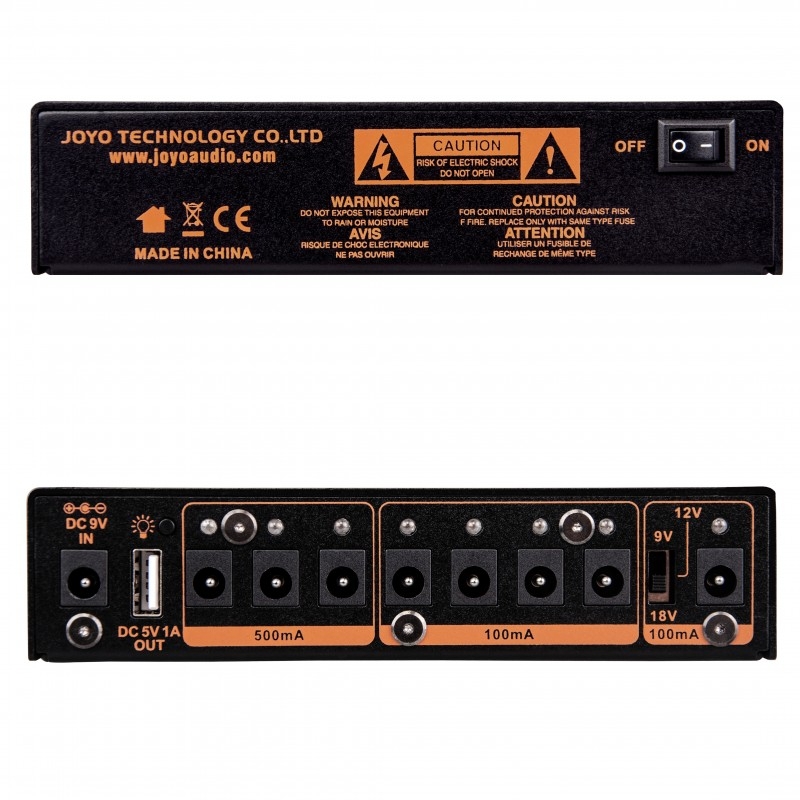 The JOYO JP 05 Power Supply features, 8 DC outputs, 4 x 100ma 9v, 3 x 500ma 9v and 1 switchable to 9v, 12v or 18v at 100ma. 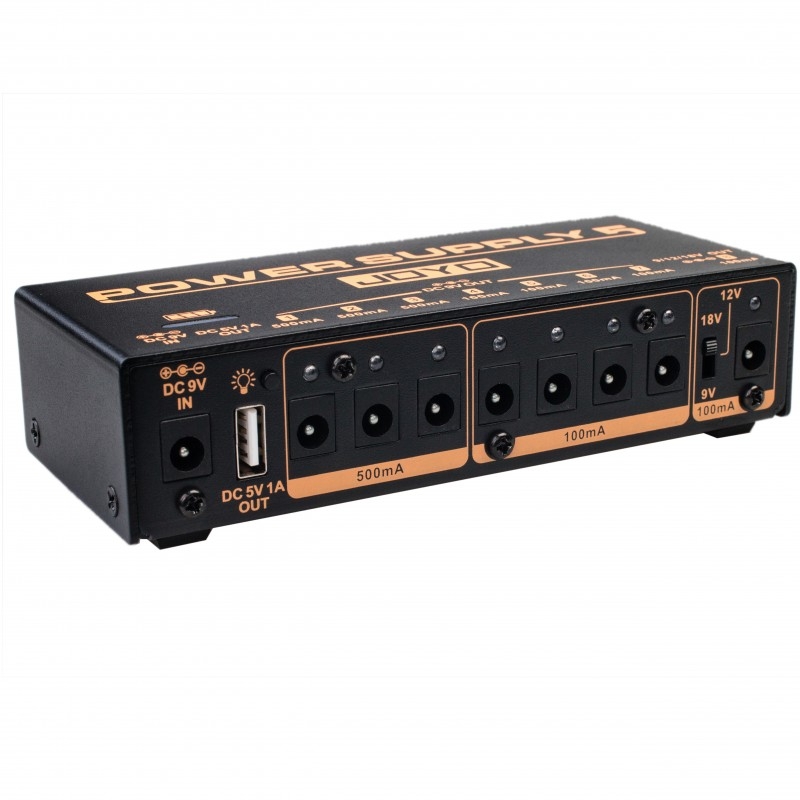 The power supply also features a 5v USB, perfect for power USB devices & charging your phone. To top off the feature list, the power supply has a built in 7.4v/4400 mAh rechargeable lithium battery pack which charges fully in 2.5 hours making sure that you are never without power. Each output of the power supply features independent filters, output overload & short-circuit protection protecting your pedals and filtering out any unwanted noises. Battery Level indicator - The Power supply has a 4 stage battery indicator, you can use the supply when it is in charging mode powered by the supplied JOYO 9v 2000ma adaptor.  The level of battery power will be indicated by the LED display on the top of the pedal. Who doesn’t love a LED to show off your gear, the JP-05 will shine brightly, 8 LEDS can light up your board in a bright cool blue glow. A word of warning, don’t press the on/off button to toggle these lights on and off whilst looking at them like I just did. They are very bright, much brighter than the LEDS on the JP02, the option to turn them off or on are a nice touch. If you are using the supply as a portable unit, it would make sense to turn them off. - DC Outputs 1-3 are 9v centre negative with 500ma each, suitable for many high end digital pedals requiring more oomph and suitable for many standard pedals too requiring less. In theory you could even run a daisy for 5 100ma pedals of each output, that's 15 pedals! 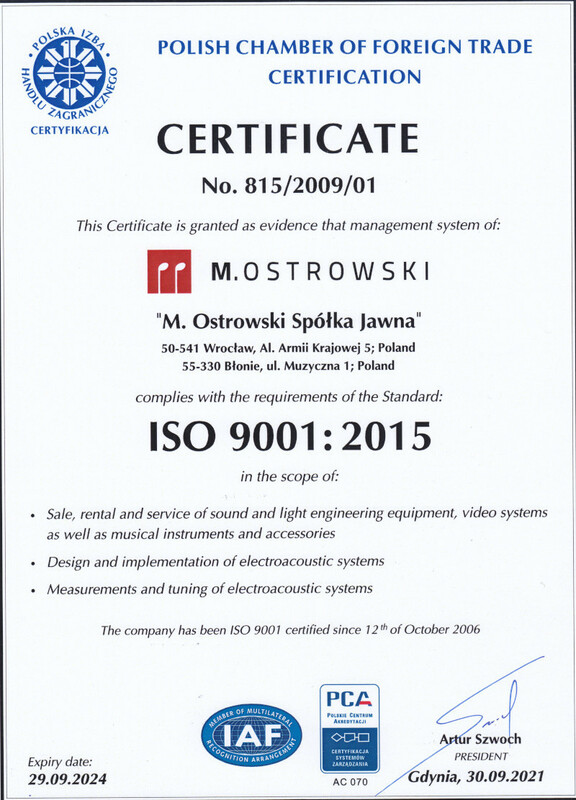 If you are thinking of doing that, read guide on power supplies for best practices. - DC Outputs 4-7 are also 9v centre negative with 100ma, suitable for the most guitar pedals at 100ma or less. - DC Output 8 can be switched from 9v,12v or 18v at 100ma. So that makes a pretty versatile power supply, useful for guitar effects and other electronic instruments. 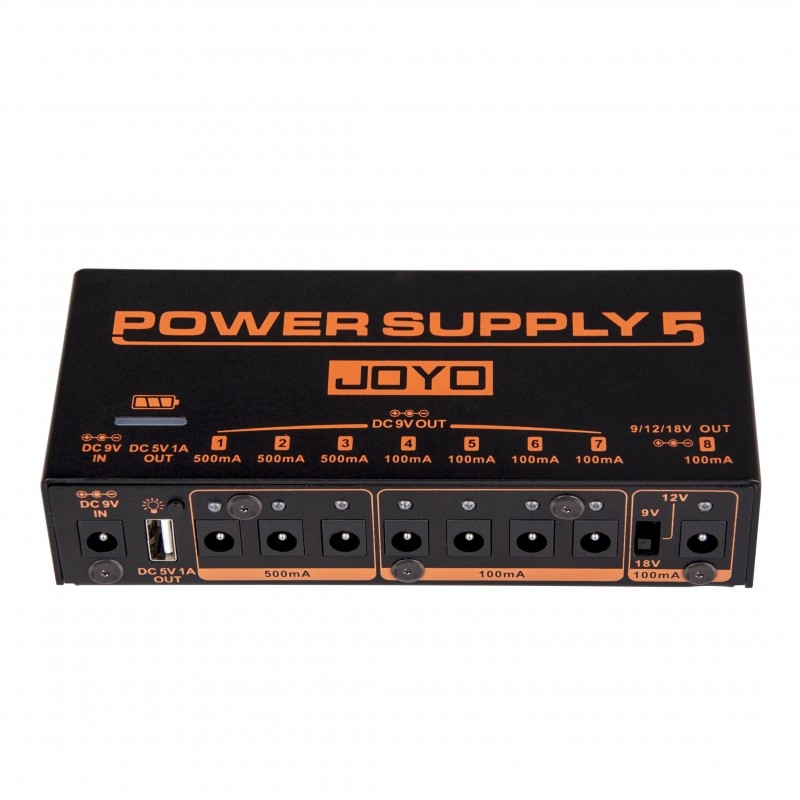 The JOYO JP-05 is even supplied with a polarity converter for instruments/effects that require a centre positive supply.